Twas’ the day before New Years and to Southern California’s surprise, snow appeared all over the land! It was beautiful and definitely the right way to start off the new year! My boyfriend and I headed out to east San Diego to Cuyamaca Rancho State Park. We grabbed out snowboards, firewood, some burgers, and our camping gear! 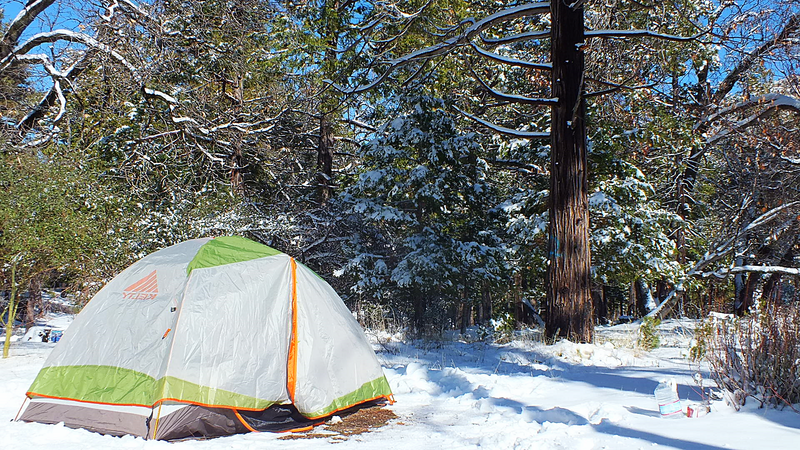 We had camped in the snow a few years back so we knew we could handle it! We got up there around 4pm before the sun was setting and found a fire road close by that was covered with snow. After hiking up a bit, we chugged our beer at the top of the mountain, tightened our boots, and rode down! It was a blast (by the way- we both hadn’t snowboarded in about 7 years)! Sounds like you had a great time. I didn’t know it snowed in So.California. Gorgeous! I’m so glad you got out and had the chance to see everything blanketed in snow. It takes scenes you know and makes it look like a completely new place. The photos are simply wonderful. Great photos! I love it when we get snow here! Fab shots ^.^ And can I just say, that I love the idea of this site. I haven’t seen much of it, but what I have seen is great 🙂 Thanks! Cool New Year photos! Happy new year!